How many bedrooms does this home have? Is it close to some shops and a handy bus stop? Does it sit without squeeze in my budget? Does the kitchen have space to roast garlic? when seeking a place to call home. If I’m permitted to hang art on the walls? Can the power points provide strength for all moods of music? Is there space for bookshelves and too many books? Can I sleep soundly at night, undisturbed by harsh sounds? Can I hear birdsong when the sun is thinking to rise? Does the sunlight shine softly into the rooms? Are there smiles or frowns in the air? How many shades of green can be seen through the windows? How many paces to a blossoming jacaranda? Does the breeze whisper gentle, welcoming words? Will a frangipani cutting thrive here? Is there a space to sit quietly with a large mug of tea? Is there a sense that I can really be me? Is it a house or is it a home? I slept nearly 12 hours on Friday night. And for the first morning in over three weeks I knew where I was when I awoke. I both love and hate that feeling when you are traveling and on first awaking you have absolutely no idea where you are, what day it is and what that very important thing is that you have to do. I have been on a journey. Both physically and emotionally, and only Friday evening did I come to a halt. I realised that my journey has covered many miles. An astonishing 13,000 or more miles or over 20,000 kilometres by air and road, and including a wonderful 2,200 miles by train. There is another very long story in there, but that is not for now. Although I returned to Myanmar earlier this week, I was travelling again within 48 hours of my arrival and was inordinately glad to return home and allow my mind and body to rest and recalibrate. It is not coincidental that my three words for 2016 have not formed until the past few days. My being needs need to come to rest and be still for the words to settle. It is hard to reflect and explore the world of words when there is a great deal happening, people to spend time with and new experiences to embrace. So the words are late. It turned out that 2015 was a complex and painful year. I leaned heavily on my words “Breathe, stargaze and realise” and brought in three more (to my surprise) to see me through the most difficult times – “Dignity, contemplation and beacon”. I cannot share any details of those times in the public domain, other people are affected and it is not appropriate or correct to speak out. The word “dignity” was critical in reminding me that the most appropriate action was to remain silent, and that has been unbelievably hard. As usual, since adopting the practice of adopting the three word mantra in 2010, I started thinking of the approaching new year in the final weeks of 2015. My process is to reflect back on the previous year, look at my priorities and then look ahead at what I want to be the key focus of the coming year. The three words enable a balance across different areas of life, and usually pick up health, family, wellbeing, practical and professional direction areas and the creative side. A balanced mantra encourages a balanced approach in the year. I enjoy the process of crafting my mantra as satisfying as the final selection itself. The first word came easily. The coming year has to focus on healing and finding my true north again. All that I had believed to be sure turned out to be fragile and turned to dust under my feet last year. The foundations crumbled under my feet and I found myself directionless. The greatest priority for the coming year is to “reorient” myself and move forward purposefully. Reorient will be at the heart of much of next year. I need not only to re-think my future, but also to set steps in place to ensure that my physical and emotional compasses have been truly re-set. Over the past months, I have feared that my inner compass had been smashed beyond repair. Gradually, though, I have come to realise that while the exterior casing had indeed been decimated, somehow deep inside the inner workings could be coaxed back into action. If the inner workings can be repaired and recalibrated minute part by minute part, the casing can surely be repaired. The key part of repairing my inner compass is to find my true north and ensure that my path ahead navigates in this direction and keeps me on the right path. Change runs deep, and this inner reorientation accompanies physical transformation too. Already I have made changes in my living situation and been adjusting to new practical arrangements. I need to think very carefully about the longer term future. I have no idea where I will be this time next year, nor a clear sense of my direction. I need to place trust and energy into the process of reorientation. Alongside the need to reorient, is the importance of healing, replenishing and investing time and energy especially in my creative activities once more. Nurture is a word which suggests growth and nourishment through love and careful attention. My health is good right now, notwithstanding the weight of side and after effects, but I know that I need to pay attention to my wellbeing and focus on gaining strength. I especially need to devote time and energy to creativity and particularly writing. The blog has been very quiet, and my commitment and writing goals had to be put to the side while the bigger stuff was worked through. I want to get back on track, nurture my creativity and produce more writing. I still have the goal of completing the first draft of the memoir of my first year in Myanmar. I need to tend to these areas and see new life and regrowth appear. My third word was, as often happens, most elusive. I played with a number of words but none was “quite right”. I had a little imaginary pot with many words in it, such as “reach, deliver, embark, embrace, pause, revise, stretch” along with many others. I wanted to convey the idea of committing to the new path and orientation once I had clarity. And then, in Singapore airport of all places, my third word appeared. “Crystalize”. My perfect third word. Crystalize has a number of meanings, including its scientific term which is the process of forming solid crystals from either a solution, melt or more rarely from a gas. It is also regularly used with the meaning of making something definite and clear. Crystalize is the right third word for many reasons. 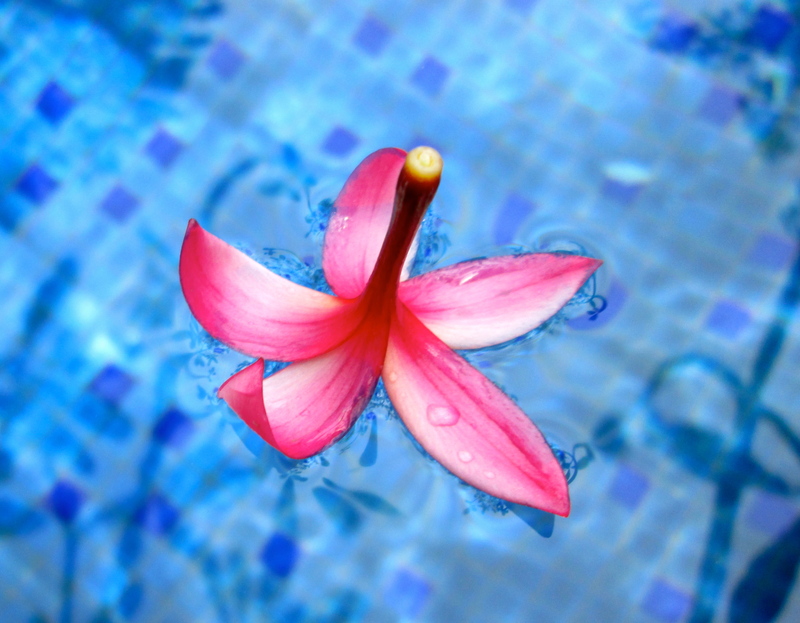 After reorientation and with nurturing it is important to achieve some stability and clarity. I do not yet know what that will look like but I do know that this will appear through this process of crystallization. From a situation of flux and change, stability will surely appear. Tiny crystals of hope, which will settle and grow into a formation and foundation for me to move forward. Crystals are complex and beautiful. Crystals absorb and reflect light and colour. Crystals are one of nature’s brilliant treasures. Quite simply, crystals are exquisite. A future which forms through crystallization will surely be beautiful. Now that my words are in place, I have a sense of both peace and purpose for the year ahead. More than half of the year has already passed, which means that it is a good time to reflect back on my choice of words for the year. Since I stumbled upon this three words exercise at the close of 2009, it has worked consistently well for me. It is timely to check back and see how the 2013 mantra is holding up. Early in the year, I also found started the quirky “five stickie” plans for my weekends. The five stickies aim to bring a bit of balance, carpe diem and inspiration into my free time and they are also guided by the three words. I need to take care of those practical and organisation tasks (focus), as well as prioritising my physical and emotional well being (treasure) and ensure that I take time for the creative things which are important in my life (design). The plans works incredibly well, possibly because it is so simple. And five is not too big a number!! My niece has also adopted the three word approach, and I am so inspired when she posts regularly on Facebook with an update on how the words are working for her. And this prompted my thoughts for a mid year (ish) reflection on my words. This is long overdue! I feel as if I have been floundering a bit, especially with my writing. I also see the need to bring a bit more order into most areas of my life. I am a bit of a butterfly – I flit about from one thing to another. My attention is easily drawn by something new and interesting. Ideas are not a problem. Or perhaps they are. I have so many that I tend to move onto an exciting new though as the inspiration strikes. I love ideas and where they take me. I like far less the graft of shaping and working with them through to fruition. And that is why I need to focus. I have a number of embryonic writing projects. Some more embryonic than others, and I recognised to need to prioritise and organise these projects if I want to see anything realised! Hence “focus”. And not surprisingly this has been the hardest one to work on. The five stickie plan really helps, as one or two of the five of each weekend’s stickies must relate to “focus”. I have taken time to better organise my electronic filing and writing work, spent time sorting and binning papers and junk which I am incredibly skilled at amassing and I have taken time to plan and prioritise my main projects”. A friend also introduced me to the Pomidoro time management tool and I find it works incredibly well for me both personally and professionally. I am much more focused when I know I have 25 minute chunks of time, and then 5 minutes to stand up, check email, make a cup of tea or even just to go to the window and look at the clouds! Perhaps there has been progress then, I realise. My second word is treasure, both the verb and the noun. This has been painful, if I am honest. I knew this year would be difficult and in March I spent the last week I ever would with my father. I cannot express how much I treasure that time and those memories. They can never be taken away and always be cherished. My break in Malaysia just a few weeks ago was a time to reflect, heal and recover and those days are also ones I treasure, holding the warm sensation of rest close and real for as long as I can. Treasure also features in the weekly stickie plans and is a reminder to focus on my own wellbeing too, with time or space for the soul and self. This is my third word, both about creativity but also taking control and being deliberate and proactive. 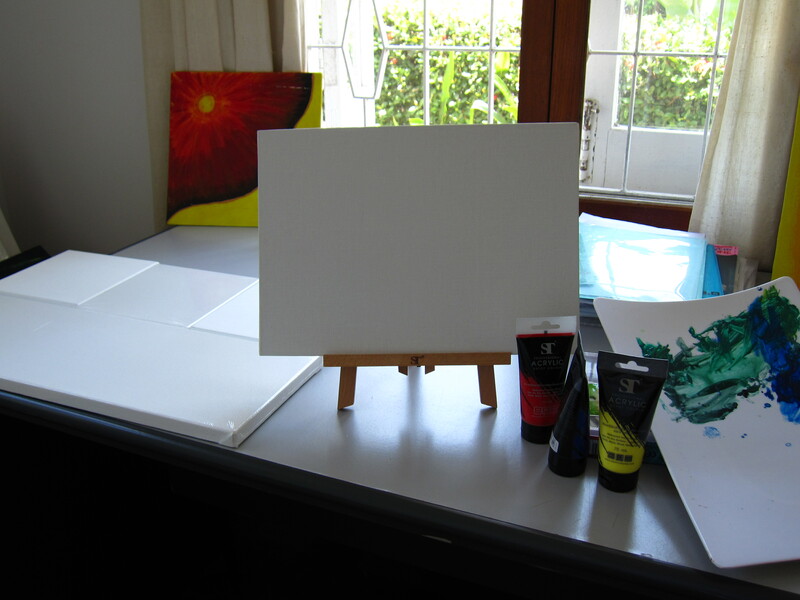 It relates closely to focus and I have again made sure to set aside time and energy for the creative side. For balance and harmony. I realise that the five stickie strategy (is this getting boring yet?) has worked really well to keep that focus. I continue to enjoy learning and experimenting in both the writing group and Photography club here – pushing boundaries and really surprising myself. So it is Sunday evening, my planned post (about my personal Irrawaddy Literary Festival experience) is nowhere near ready …… I have been guided by my five stickies for this weekend but still I have things to cram into the final hours of the weekend. Why is this? I am being focused, and fairly productive. So why am I way behind on my blogging? I can tell you why. Happily, there is not an underlying or upperlying cancery reason for this which is in itself worth noting. Rather the opposite in fact. 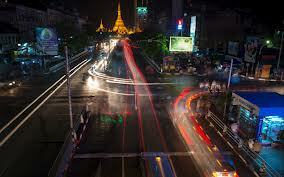 It is because life in Yangon these days is really busy – Yangon is happening!! Combine that with current good health, and the result is that I am spoilt for choice when it comes to activities and ways to spend my leisure time. This week was particularly busy. On Monday our Book Club met, and we talked about Ali Smith’s Book “There but for the“. On Tuesday the new Yangon Photography Club met to share images on the first month’s theme – Transport. 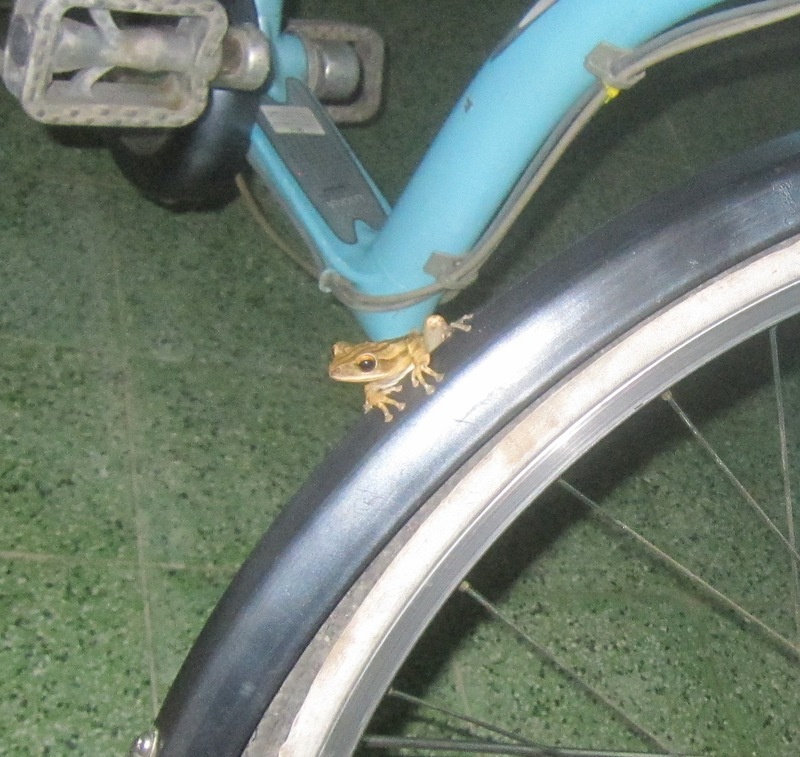 I tend to see things a little differently, and one of my contributions (frog on a bike 🙂 ) for the evening was discussed, despite my camera being the only point and shoot in the group. This little frog was unexpectedly clinging on to my bike as I was leaving for my my regular swim and I was able to get a very quick shot. Very helpful to get suggestions and feedback and a spur to upgrade my camera. Scary but exciting territory. On Wednesday evening, our Writing Group met and we spent another inspiring and interesting evening, sharing our work and giving feedback to each other. We assigned ourselves with a task for the next meeting – a try at flash fiction with a writing prompt. It is good to try something new. Also a bit scary though! Half the week had already disappeared in a flurry of activity and energy. And it did not stop there. Thursday evening, saw a wonderful get together to bid a wonderful couple farewell as they prepare to leave Yangon at the end of their assignment. It was one of those evenings when you really bask in a rosy flow of contentment in the company of special people. And then it was Friday evening and the working week already over. In addition to the evening activities, I enjoyed my daily cycle (now up to 6.5 km every morning) and half mile swim. There are so many options and choices in the city – have a look at the WhatsonYangon site to get a sense of the variety. If you have a look at the “blogs from here” links on the right hand side bar of this page, you will also see that the number of blogs is growing. The city is happening indeed! And that is why I am not quite ready to share my experience of the recent Irrawaddy Literary Festival. But it is coming very soon, I promise!